The African Tiger Fish is a characin, but it certainly is not your typical aquarium tetra! The African Tiger Fish Hydrocynus vittatus is an unusual characin. This fish is best described by its scientific name. "Hydrocynus" means "water dog"and "vittatus" means "striped," and, indeed, the African Tiger Fish looks like a "striped waterdog." This big, ferocious fish is covered with large, iridescent, silvery scales, sometimes with a golden cast. Other common names for this fish are Tiger Fish, Tiger Characin, Ndweshi, African Tigerfish, and Tiervis. This Tiger Characin is definitely a specialty fish. It can reach an impressive size, up to about 3-1/2 feet (105 cm) in length and over 60 pounds, but it usually won't get much longer than about 30 inches (75 cm) in the aquarium. One look at those teeth tells you that the African Tiger Fish is a voracious predator. The African Tiger Fish is related to the Piranha but actually gets much larger. They can use those huge teeth to chop even large fish into bite sized pieces. The African Tigerfish is not actually hard to care for in terms of water quality or food variety, but they get really big and eat a lot. The large size alone limits the type of aquarist who will able to keep one. When first purchased as small juveniles, they may initially be kept in a large home aquarium. But eventually, full-sized adults will need a very large tank. An aquarium of 650 gallons, even upwards of a 1000 gallons or more, will be needed to keep them happy and healthy. In its adult size, this giant fish is really best suited for public aquariums or for highly experienced aquarists with the space and financial ability to properly care for them. African Tiger Fish are usually kept in species aquariums. They will school with their own species and more than one can be kept if the aquarium is large enough. They will also school with fish of similar temperament, however, any tankmates need to be appreciably larger. As they age and grow even larger, however, these African Characins tend to become less tolerant of their tankmates and need to be housed singly. Large African Tiger Fish casually swimming and on the lookout for food! The African Tiger Fish Hydrocynus vittatus was described by Castelnau in 1861. They are found throughout Africa, from Egypt to South Africa. They are most common in the Senegal, Nile, Omo, and Congo Rivers and in Lake Tanganyika. The species is listed on the IUCN Red List as Least Concern (LC). It has a wide distribution and is generally abundant and common. Other common names it are known by are Tiger Fish, Tiger Characin, Ndweshi, African Tigerfish, and Tiervis. These tiger fish inhabit mainly larger rivers and lakes. All but the largest specimens will swim in schools with other similarly sized fish, roving about and preying on food. They are fierce and voracious predators, feeding on whatever is available. While they mostly eat other fish, they will also consume some detritus and plant matter. The African Tiger Fish also serves as a food fish for many natives. Social Grouping: Varies - They swim in schools with other similarly sized fish, though very large specimens are loners. IUCN Red List: LC - Least Concern - This species has a wide distribution. Although it has been locally depleted by heavy fishing, it is generally common and abundant and therefore listed as Least Concern. It has been assessed regionally as Least Concern for central, eastern, north eastern, southern, and western Africa. The African Tiger Fish can get up to 41.3 inches (105 cm) in length and weigh up to 62 pounds (28 kg) in the wild. In captivity, they are unlikely to achieve a size of much more than about 30 inches (75 cm) and have a lifespan of between 10 and 15 years. This fish has an elongated body that tapers on both ends and a forked caudal fin. Its large head features prominently visible teeth, 8 per jaw. The teeth are conical in shape and very sharp. The African Tiger Fish uses its teeth for grasping and chopping rather than tearing. These teeth are occasionally replaced throughout its life. 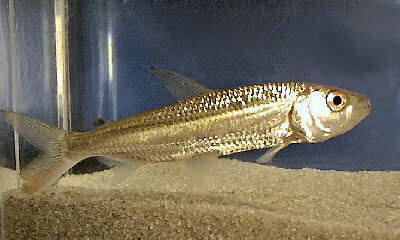 This fish has a silvery blue body overall with rows of large, iridescent, silvery scales, sometimes with a golden cast. Some individuals will have red and yellow on the fins. Males and females are similar in form and color, but females are generally smaller and more full-bodied. Size of fish - inches: 41.3 inches (105.00 cm) - These fish get up to 3 1/2 feet (105 cm) and weigh up to 62 pounds (28 kg) in the wild, but they are unlikely to reach much more than about 30 inches (75cm) in the aquarium. Lifespan: 15 years - They have a lifespan of between 10 and 15 years in captivity. African Tiger Fish are large predacious fish. They are undemanding of water quality and eat readily, but their size alone limits who will able to keep them. When small, these fish will seem like an interesting and exotic addition to your tank. But they grow to an alarming size and have amazing bursts of speed, both of which make providing a suitable environment over the course of their lifespan very challenging. Small juveniles may initially be kept in a large home aquarium, but eventually they will need a very large tank. In their adult size, they are really best suited for public aquariums, or kept by experienced fish keepers with the space and financial ability to care for these giants. Aquarist Experience Level: Advanced - This fish grows up to 3.5 feet in length and requires a very large tank of 650 gallons or more. These restrictions make it unsuitable for the average hobbyist. These fish are primarily considered to be carnivores. In the wild, they are a major predator. Though the bulk of their diet is fish, they will also consume some detritus and plant matter, so are actually omnivorous. In the aquarium, they can be fed meaty foods like whole fishes and shrimps. When initially introduced into the aquarium, they will readily eat live foods, but once they have acclimated, they can be offered frozen foods as well a pellet diet. Small juveniles will take flake but will soon need to be moved to pellets. Trout pellets work well. Some aquarists report that they will ignore prepared foods when live food is available. Tablet / Pellet: Yes - These fish may not accept processed foods at first but will usually adapt to them with time. Tiger Fish are big, messy fish that require ample filtration. Water changes of about 30 - 50% are needed every other week, depending on the bioload, to keep this fish happy and healthy. Water Changes: Bi-weekly - Do a 30 - 50% water change every other week. African Tiger Fish is an extremely large, predatory fish. Because of its large adult size and propensity for schooling with other similarly sized fish, it needs a very large aquarium. When first obtained as a small juvenile, it can be kept in a large home aquarium, but as it grows it will need a much larger tank. As it attains its adult size, at least 650 gallons will be needed to keep it happy and healthy, with upwards of 1000+ gallons or more being even better. These fish will occupy all parts of the aquarium, so they need a spacious open area for swimming as well as a decor of plants, roots, and driftwood to provide them with some hiding places. They need good, clean water and a moderate water flow, so adequate filtration is important. Minimum Tank Size: 650 gal (2,460 L) - Juveniles can be kept in a large home aquarium, but full-sized adults will need at least 650 gallons or more. Water Region: All - These fish will swim in all parts of the aquarium. Though the African Tiger Fish is not necessarily aggressive, it has a big appetite. Not many species can survive in a tank with them. This fish will do best kept in a species tank. This fish can be kept with other similarly sized or larger, non-territorial species. However, the African Tiger Fish is less tolerant of tankmates outside its own species, so be cautious in selecting companions. In particular, very large individuals are likely to grow less tolerant of co-inhabitants. Temperament: Large Aggressive - Predatory - This fish is more predatory than aggressive; however, tankmates need to be significantly larger. Same species - conspecifics: Yes - These fish will swim in schools, though very large specimens may become loners. Peaceful fish (): Threat - Tankmates should be similarly sized or larger to avoid becoming a meal. Slow Swimmers & Eaters (): Threat - Characins will out compete them for food. Males are larger and fuller than females. The African Tiger Fish has not been bred in the aquarium, though it has been successfully bred in captivity as a fishery specimen. Presumably, breeding them in an aquarium would be difficult, or even impossible, and would require a very large tank. For a general description of breeding characin fish, see Breeding Freshwater Fish: Characins. In nature, these fish spawn for just a few days each year during the rainy season, usually in December and January. They migrate up river and into small streams. The female lays a large number of eggs in very shallow water among submerged vegetation. After the eggs hatch, the young live in the shallows until flood waters force them out into larger waterways. Like most giant fish, the biggest concern with the African Tiger Fish is lack of space and food. If you can meet these needs, not much goes wrong with these giants. These fish are hardy and disease is not usually a problem in a well-maintained aquarium. However, aquarists still need to take precautions against health problems and disease. Anything you add to your tank can introduce disease. Not only other fish but plants, substrate, and decorations can harbor bacteria. Take great care and make sure to properly clean or quarantine anything you add to an established tank so as not to upset the balance. Because these fish eat live food, disease can be passed to them from their foods. Make sure to quarantine live food before feeding. A good thing about the African Tiger Fish is their resilience. An outbreak of disease can often be limited to just one or a few fishes if dealt with it at an early stage. When keeping more sensitive types of fish, it is common for all fishes to be infected even before the first warning signs can be noticed. The best way to proactively prevent disease is to give your fish the proper environment and a well balanced diet. The more closely their environment resembles their natural habitat, the less stress the fish will have and the healthier and happier they will be. A stressed fish is more likely to acquire disease. As with most fish, the African Tiger Fish is prone to skin flukes, parasitic infestations (protozoa, worms, etc. ), ichthyobodo infection, parasitic infestations (protozoa, worms, etc. ), bacterial infections (general), and bacterial disease. Aquarists should read up on the common tank diseases. Knowing the signs and catching and treating them early makes a huge difference. For information about freshwater fish diseases and illnesses, see Aquarium Fish Diseases and Treatments. The African Tiger Fish or Tiger Characin are occasionally available but usually come with a very high price tag. Even though they aren’t considered rare, like many large fish, they are expensive when small because they are small for such a short period of time. The African Tiger Fish is primarily a game fish and food fish. They can't be shipped into Florida, as the Florida Fish and Wildlife Conservation Commission has restrictions placed upon the transport and handling of certain species, including this one. I will be doing a presentation based on this fish and this means that I have to know it like the back of my hand, and so far its cool, I'm loving it, it's so adorable and beautiful. How old will a Tiger fish weighing around 6 kg be? The Kariba Zimbabwe species. How long have you had it? Did you get it from a pet store or from a previous owner? I don't think there's any sure way to tell how old it is. In the wild they can get to be around 28 kg, but in captivity they don't usually get that big because of environment constraints. This page states that they need a 1,000 gallon aquarium. What are the dimensions of this aquarium? They can be different dimensions but run about 120 inches wide, 50 inches deep and 40 inches accross --- there are various sizes though.